One triple strand bracelet of cultured pearls. 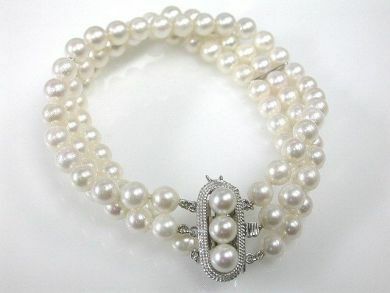 The bracelet contains three strands of twenty-nine pearls per strand. The pearls are of rose colour with silvery overtones, good luster and colour distribution. The bracelet includes two silver divider plates and a silver clasp with three additional pearls.